You're in for a bellissimo journey to the spectacular capitals of Italy and a Bavarian village that kept its 17th-century covenant with God. On arrival in Rome, spend the day at leisure before joining your fellow travellers and Travel Director for a Welcome Reception and orientation drive. We embark on an included sightseeing tour with a Local Specialist at the Vatican Museums this morning. Here, we'll 'Dive into Culture' and pay tribute to the great men whose astonishing works were said to have been inspired by the divine. See the Bramante staircase, the magnificent frescoed ceiling painted by Michelangelo in the serene Sistine Chapel and his sorrowful Pietà during our visit to St. Peter's Basilica. We tread in the footsteps of gladiators, slaves, merchants and royalty, crossing the Tiber River into Imperial Rome to visit the ancient Colosseum, the largest amphitheatre in the Roman Empire. Imagine crowds of enthusiastic onlookers cheering their chariot racers to victory at the Circus Maximus before a free afternoon to discover the Eternal City or relax at a pavement café. The narrow lanes and expansive piazze of Rome are yours to explore today. Ask your Travel Director for tips on what to see and do, or consider an Optional Experience delving into the tragic history of Pompeii. Journey north to the birthplace of St. Francis of Assisi on the slopes of Mount Subasio. Your Local Specialist will take you to the Basilica of St Francis, the final resting place of this famous saint. Your final stop in Assisi is Giotto's enchanting frescoes before the journey continues through the scenic Tuscan countryside to the Renaissance city of Florence. Enjoy a leisurely encounter with the artistic and architectural marvels of Florence during your sightseeing tour with a Local Specialist. Visit the striking Piazza della Signoria with its impressive sculptures and palazzi. See the multi-coloured marble Duomo and Baptistery, then stroll over Ponte Vecchio, straddling the Arno River. Learn about the quality and workmanship of two of this city's historic industries at demonstrations of Florentine leathercraft and 18-carat gold. Spend the rest of the afternoon discovering the historic centre of Florence, shopping for high-quality leather, or admiring the artistic contribution of the Medici family at every turn. After free time in Florence, cross the fertile Arno Valley to Pisa and join a Local Specialist to visit the Square of Miracles, home to the incredible Leaning Tower and beautifully sculpted marble Cathedral. See the ornate Baptistery and the Camposanto, built on sacred soil brought back from the Holy Land during the Crusades. Your unforgettable encounter with Tuscany continues this evening as you 'Connect with Locals' over a Be My Guest dinner joining Count Miari Fulcis on his 15th-century organic olive oil estate that has featured in many famous films. known for the delicious spaghetti sauce that bears its name. Your sightseeing tour with a Local Specialist includes views of the Kissing Towers which lean towards each other, seemingly poised to embrace. Then it's off to the romantic island city of Venice with its rich cultural and artistic heritage. Spend time at leisure gliding along its enchanting canals in a gondola or wander through the city's labyrinthine lanes, over bridges and into quiet campi before dining tonight at your hotel. Savour the iconic and unexpected highlights of Venice as you cruise by private launch to St. Mark's Square to admire the Bridge of Sighs, Palladian churches, Customs House, St. Mark's Basilica and the ornate Doge's Palace. 'Dive into Culture' and delve into the delicate Venetian art of glassblowing on Giudecca Island before spending the rest of the afternoon at leisure. Visit the Fine Arts Academy, relax at a café on St. Mark's Square or consider a boat trip to the colourful fishing island of Burano for a delicious meal. Sites made famous in poetry, song and prose are explored today during a leisurely stroll from our hotel along the canals to the famous Rialto Bridge where we will join a guided Small Group Sightseeing walking tour, which will bring all the flavours of Italy to life at a centuries-old food market. Amble through the narrow calle of Venice and admire the beautiful architecture, walking over the Rialto Bridge before spending the rest of the day to visit the sights of your choice. 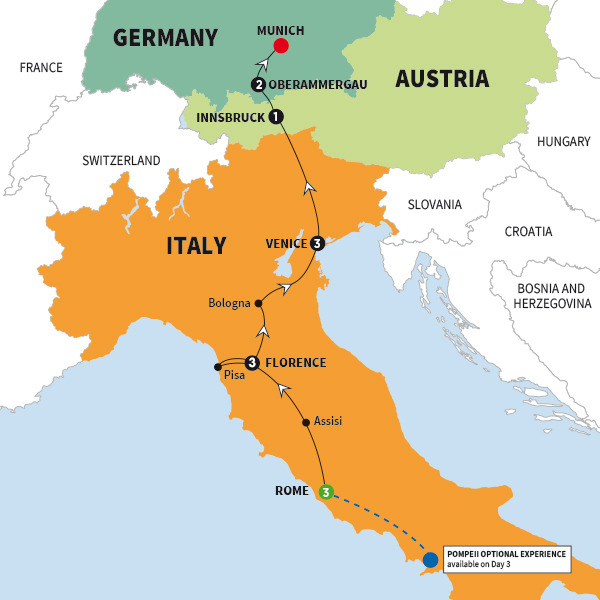 This morning say arrivederci to Italy as you cross the Brenner Pass into the Austrian Tirol. Stop in Innsbruck and see the Golden Roof, enjoy free time before checking into your hotel. After a leisurely start to your day, explore Innsbruck on your terms discover the city's ties to the Winter Olympic Games. Later, travel to the Bavarian town of Oberammergau where tomorrow devout villagers will perform their once-in-a-decade Passion Play. This evening dine at your hotel. Witness a Trafalgar Highlight and display of enduring faith - a performance that gives thanks to God's grace every ten years since 1634, when the villagers of Oberammergau pleaded to God to spare them from the ravages of the plague. Take your premium seats for this poignant performance depicting the life and death of Jesus Christ. Dine at a local restaurant this evening, before returning to your seat for the captivating second half of this performance as night falls. Say farewell to your fellow travellers at the end of a spiritual journey. Transfers are available to Munich Airport. Conditions apply.